Is atheism bad for science? Since publication of books like Richard Dawkins’ The God Delusion in the mid 2000’s some reviewers and commentators have argued that the “new atheists” and vocal “atheist scientists” are “bad for science.” That they are turning people, especially students, away from science. Even that a hostile public will endanger future funding science funding. Some of these naysayers have an obvious motive. 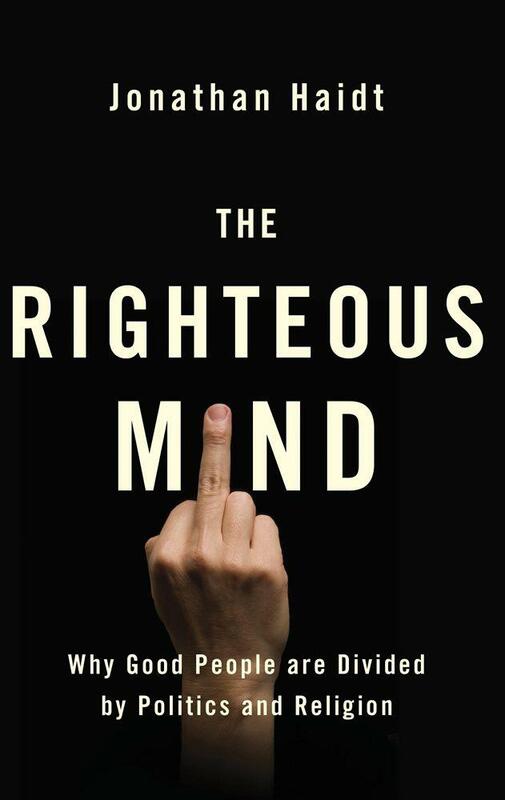 The militant religionists who just wish the people like Richard Dawkins and PZ Myers would STFU. Their concept of a pluralist society does not extend to allowing a public voice to people who disagree with god beliefs. They are “offended” by such voices. But there have also been the non-religious who disagree with what is being said. Or, agree but don’t think the way it is said is polite or quiet enough. Possibly these people are more honest in their concern that scientists who are up-front about their atheism could be endangering public acceptance of science and its future funding. I don’t think that is a principled position – surely in a democratic society atheists have as much freedom to being “vocal” as believers have. But should they be concerned about public opinion? 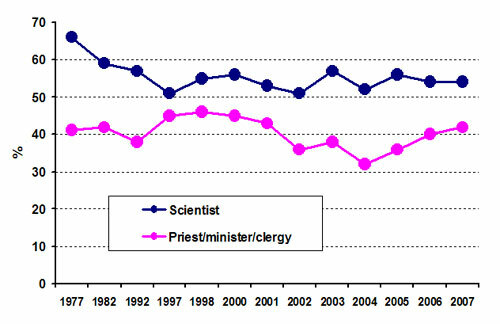 The data in the figure below show responses of “very great prestige.” As the complaint about “atheist scientists” and “new atheists” causing a decline in support for science have come from religiously motivated people I thought I would also include the data for religious professions. Contrast this with the public’s opinion of the religious professions. The mean numbers supporting “very great prestige” have been about 40% – with a minimum of 32% in 2004. Now, I wouldn’t make too much of these sort of statistics. But they certainly don’t support the thesis that “atheist scientists” or “new atheists” are responsible for turning the US public off science. 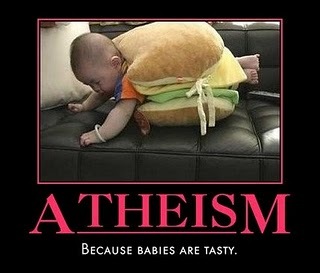 Remember – the “new atheist” phenomena that theological commenters complain about started in the early to mid 2000s. Books like “The God Delusion” and the new willingness of scientists to be open about their atheism, especially after September 2001, do not seem to have led to the feared loss in prestige for the profession among the US public. Maybe the “new atheists,” “atheist scientists” and their books have turned the public off the religious professions? Or more likely, the decline in the mid 2000’s could have resulted from the attack on the US by religious terrorists in September 2001. But what about the religious attacks on evolutionary science and promotion of creationism and “intelligent design” alternatives? Perhaps publicity around the Dover trial and the legislation being promoted by creationists in various State legislatures have influenced public opinion. Even the proliferation of books attacking “new atheism” – after all there have been many more of these than “new atheist’ books themselves. Perhaps these religious militants should be told by their more liberal brethren to STFU. Perhaps the more thoughtful believers in our society should turn their attention and concern away from “atheist scientists” and “new atheists.” Maybe they should be warning their own militants to stop being so “strident” and militant”. That their brash behaviour is endangering the public’s acceptance of religion in our societies. Maybe even threatening future funding for religion. Just imagine of the public got so pissed off they agreed to do away with the privileged position religions have with tax exemption? The atheist billboards which went up in three New Zealand cities recently have provoked some interest. Most of it has been quietly positive. 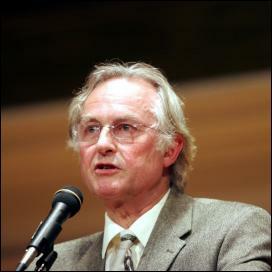 There’s no doubt about it though – there is a controversy around Richard Dawkins. Just mention his name in the blogosphere and you get all sorts of extreme reactions. Almost always negative. Sure, you will get some, usually milder and more reasonable, positive reactions. After all, he is a bit of a scientific rock star. His recent lectures in New Zealand and Australia were sold out. Many had to be shifted to larger venues. And his books certainly sell well. I myself waited in a queue for 2 hours to get my copy of “The Greatest Show on Earth: The Evidence for Evolution ” signed by the author. As one wit said, this queue seemed to go right back to the “”Big Bang.” But I was in good company and enjoyed the conversations while waiting. Personally I am always wary of personality cults. Elevate a person to sainthood and you will inevitably find they have feet of clay. I certainly don’t think it has come to this with Dawkins, despite the high regard many people have for him. Several Christian apologetics blogs have commented on Antony Flew’s recent death (see Antony Flew 1923-2010, Antony Flew dies at 87, Theology Geek, and Professor Antony Flew – Obituary…). The unfortunate aspect of these blogs is that they indulge in a little bit of “body snatching.” Not that this didn’t happen before Flew’s death. 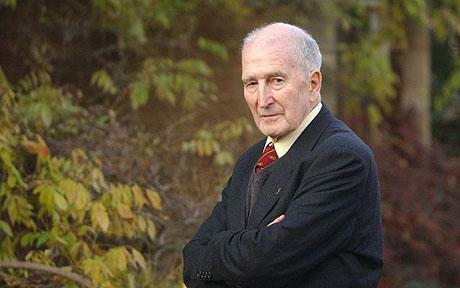 Here is a post I wrote on in February last year (The Antony Flew controversy). Richard Dawkins – wrong again! And once again, he admits his mistake and apologises! Have a look at ‘An Apology’ by Richard Dawkins. I admire people who can acknowledge their mistakes. People who won’t, but will go through all sorts of mental gymnastics to justify a mistake, are really behaving like children. Their egos are overriding their logic. This time Richard is apologising for the way he and his team handled the reorganisation going on at the RichardDawkins.net website. The changes being made to the forum on this site have upset some participants, some rather emotional and outrageous statements were made and staff reacted defensively. Richard himself responded to these attacks in what he himself describes as “insensitive ‘Outrage‘ post, which was written in the heat of the moment.” He is apologising for the tone of his post, as well as mistakes made in handling the changes. He has also introduced some changes to the reorganisation of the forums to accommodate some of the concerns expressed.